French political analyst and university professor Michel Bussi garnered acclaim and awards in his homeland for his detective fiction over the past decade, but it was the publication of this standalone novel in early 2012 that catapulted him to near household-name status. More than 700,000 copies were sold in France (100 times his debut sales), and it was translated into two dozen languages, optioned for film adaptation, and serialised in a newspaper for months. Un Avion Sans Elle is also the first of his books to be published in the UK, allowing us English-speaking crime fiction fans to find out just what all the fuss is about. It is 1998, and Christmas looms. Private eye Credule Grand-Duc sits at his desk, dispirited, having spent nearly eighteen years failing to find the truth behind a miracle wrapped in a tragedy. A fiery plane crash near the Swiss border in 1980 had incinerated passengers and crew, but a newborn baby somehow survived. Joy turned to confusion and heartache, however, when two families – one rich, one poor – claimed the baby as their own. Grieving grandparents found themselves at war in the public eye and the courts. Was the baby who survived Lyle-Rose or Emilie? Grand-Duc had been trying to answer that question ever since, but had come up empty. As midnight and the girl’s eighteenth birthday approaches, he grabs his gun and prepares to farewell this life, only to uncover a secret that upturns everything. Before he can share his last-minute discovery, however, he is silenced; homicide, not suicide. AFTER THE CRASH is told in switching narratives, as we follow Mark (the baby girl’s maybe-brother) as he reads Grand-Duc’s casebook in 1998 and tries to work uncover the truth the detective left behind. Just how much can we trust what Grand-Duc wrote? What is the real truth? Bussi spins an intriguing and unique mystery; a search for someone who isn’t missing, physically, but whose identity is. The novel has plenty of requisite clues, twists, and red herrings, while also posing some interesting questions about what makes someone who they are, how the media focus then forget tragedies, and how one twist of fate can create all sorts of ripples. There is a strong narrative drive throughout AFTER THE CRASH, with the early “who is this girl, really?” hook cinching readers in for the roller coaster. The ‘detective’s diary’ device could fall flat, but seems to work well for this story – helped by a little suspension of disbelief now and then (Why wouldn’t Mark just skip to the end to check if there was an answer? Would someone really write a casebook in that style and language?). One flaw in an otherwise very fine piece of thriller writing is that the characters can at times feel like moving pieces; I didn’t feel particularly connected to many of them. This gives an effect of observing something very interesting as it unfolds, rather than being fully caught up in it, or sucked into the experience on a deeper level. Despite this quibble, I thoroughly enjoyed the read. 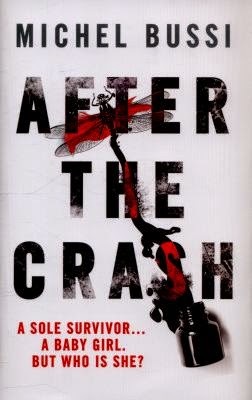 AFTER THE CRASH is written in something of a French style, in terms of pacing and other aspects. The story gets pretty dark, twisted and chilling in places – not in terms of gratuitous violence, but rather disturbing themes and situations. As it builds to a climax I was thoroughly hooked, and although some of the twists were predictable, Bussi still managed to deliver a few surprises along the way. A very good read. This review was originally published on EuroCrime.